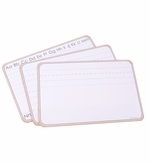 Lapboards or mini handheld whiteboards are a great option to give out to each student in the classroom to engage the class, encourage participation and get instant feedback on individual comprehension. 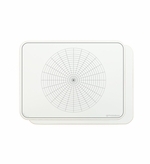 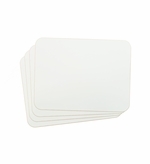 But they are also a great option when you need a small portable whiteboards or are working with a small group or someone individually. 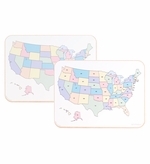 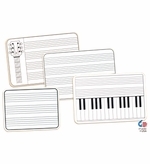 We have a great line of stock classroom, music and sports lapboards but we compliment that with the ability to customize these small boards with whatever design our customers want. 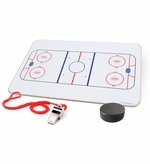 Many people assume that they need to purchase large quantities to customize boards like this but that isn't the case with us, we don't require large quantities or charge huge set-up fees to design your boards. 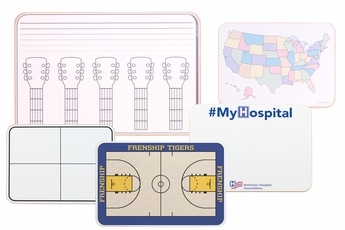 We have found that many coached like to include their team logo on their sports boards; many hospitals use these as patient communication boards while including their hospital logo but we can customize these boards with any design you can think of. 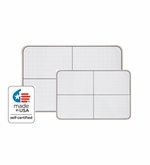 And just because these boards are small and inexpensive don't think they aren't good quality, we use the same Opti-Print™ dry erase surface that we use on our biggest wall mounted boards. 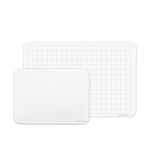 So, these boards will have the same vibrant full-color graphics and premium ghost=free dry erase surface as any of our printed dry erase boards.